In spite of being at an initial stage, the global smart bottles market is foreseen to be highly competitive and fragmented. The global smart bottle market is propelled by advancement in technology regarding the features of innovative products and connectivity. Key players operating in the global market, for example, Spiritz, Myhydrate, Thermos LLC, and Adheretech Inc., every one of them in 2016, held below 5% of the total revenue produced by the market all over the globe. Some more important players in global smart bottle market are Kuvee, Inc., Hidrate Inc., Sippo, Hydrasmart, Trago, Inc, and Ecomo Inc. The local and global players are expected to experience good scope of growth in several regions due to less stringent regulations with respect to quality and features comprised in products mandatory for sale. Manufacturing of cost-effective products along with new facilities are anticipated to give an upper hand to regional organizations in contrast with the global ones that are paying more sums for the process of research and development. Global players are foreseen to benefit from associations, mergers with other major companies in the field of health, fitness, and technology. According to a recent report published by Transparency Market Research (TMR), the global market for smart bottles is expected to expand at a CAGR of 14.3% during the forecast period from 2016 to 2024. In 2016, the market was valued around US$88.8 mn. This figure is likely to reach around worth of US258.8 mn before end of forecast period. 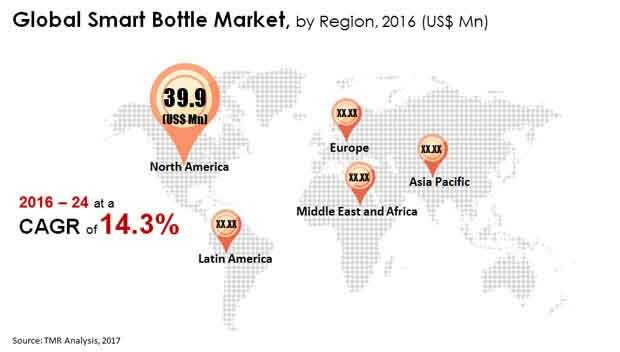 As per the application, the global smart bottle market is ruled by the smart bottle segment as per the revenue being contributed in the application segment of the global smart bottle market, estimated for nearly a 56.4% of the entire market share, back in 2016. Geographically, North America region is foreseen to lead to because of the maximum market share, due to advancement in technology in manufacturing industry. Among the major factors driving the demand for smart bottles all over the world, are rise in awareness regarding the entire body fitness and healthcare in the people in almost all regions, around the globe. Moreover, rise in number of tech-savvy consumers and increase in willingness to spend more for the premium and advanced products. With the abilities for example, reminding consumers regarding the drinking water after a certain interval, and analyzing between several levels of body hydration in the people are some of the factors, are attracting customers and contributing in the surge in demand for global smart bottle market in forthcoming years. Nevertheless, there are certain factor that might restrict the market growth in upcoming years. Among them, one such factor is the increased expenses of such bottles coupled with less possibilities of customization. Among the major factors driving the demand for smart bottles all over the world, are rise in awareness regarding the entire body fitness and healthcare in the people in almost all regions, around the globe. With the abilities like, reminding consumers regarding the drinking water after a certain interval are some of the factors attracting customers and contributing in the surge in demand.